Special Order Item from mfg. if available. 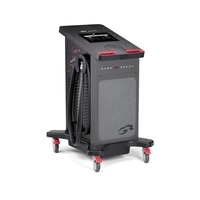 Game Ready® Med4 Elite® Multi-Modality Therapy Unit Game Ready® introduces a breakthrough, multi-modality, dual-user recovery system. Touchscreen- controlled Med4 Elite® integrates iceless cold, controllable heat, rapid contrast, and active compression therapies like never before. This system integrates cryotherapy, thermotherapy, rapid contrast therapy, and intermittent pneumatic compression therapy in one device. Various treatment modalities can be used individually or in combination to reduce pain without narcotic medications, control edema, or swelling, encourage arterial blood flow, improve range of motion, and accelerate the body's natural healing mechanisms. Features dual microprocessors, enabling comprehensive and flexible treatment options for two simultaneous patients. Users can easily alternate between and combine among four therapeutic modalities- as well as control, adjust, and monitor treatment times, temperature ranges, and compression settings with fingertip convenience. Compatible with the majority of Game Ready's® line of anatomically designed, low profile, circumferetial wraps to treat major body part effectively and comfortably. Med4 Elite® includes:control unit, power cord, two connector hoses, two drain hoses, one Game Ready® USB flash drive, user manual, quick start and quick reference guide.